A Tour Of The Charleston Capitol Market - A Gorgeous Farmers Market Like No Other! A few times a year, business travels take me through Charleston, West Virginia, and a mandatory side stop at what has become one of my favorite farmers markets to visit, the Charleston Capitol Market. I can never seem to leave there without loading up the car with some type of vegetable plant, shrub, or hanging basket I couldn’t resist. Not to mention, just being able to spend an hour or two walking and taking in the sights, smells and activity is incredibly good for the soul. Farmer’s markets and open city markets have begun to spring up all over, and it so incredibly wonderful to see. There is something so amazing about strolling outdoors and finding locally produced fruit, vegetables, plants and more. It got me to thinking that in addition to all of the wonderful home gardens and gardening tips our readers share, that we should create a spot on the site to showcase these wonderful markets that exist all over the world. So today, to get the ball rolling, I thought I would share one of my all-time favorites, the Charleston Capitol Market. 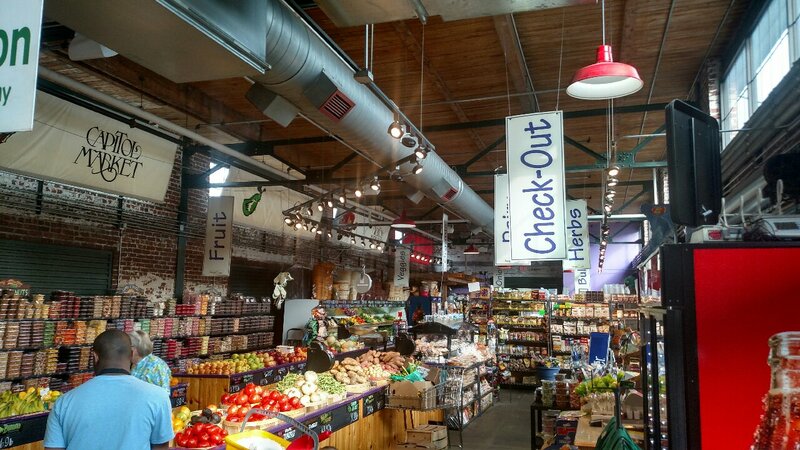 The beauty, activity and sheer size of the Capitol Market is simply stunning to me. I think what I love most is that it was built smack in the middle of the city. It didn’t always look as stunning as it does now. The area had once been home to a bustling rail yard built in the late 1800’s that served the Kanawha and Michigan Railroad. But, by the 1990’s, all that was left was the crumbling remnants, and the spot had become more of an eyesore for the community than anything else. And then it all changed! In 1997, the old rail yard was cleared out and cleaned up with hopes to return this downtown spot into a thriving commercial center. By all accounts – it certainly has worked! With 35,000 square feet of canopied open-air space, and another 16,000 square feet of indoor retail area, 800 Smith street in downtown Charleston is now home to a year-round outdoor market, and indoor shops that showcase everything from wines, to fresh fruit, vegetables, meat, fish, chocolates and more. It even includes a great local restaurant, SOHO’s, where diners can enjoy their meals inside, or out on the rail docks sitting above the open market. The farmers market features over 40 West Virginia seasonal growers, producing and selling everything from flowers, vegetables, Christmas trees, wreaths, pumpkins, gourds and more. And with more than 500,000 visitors a year and $10,000,000 in sales – it’s also a big shot in the arm for the local economy. It is everything that is right about what local should mean and be. And perhaps why I love stopping every chance I go through the historic town. Maybe even more exciting is that these types of places are popping up all over, and it just goes to show that home grown produce and products are still valued by us all. So, feel fee to take a stroll through the market with our pictures below. We want to showcase gardens of all shapes, sizes – from all around the world. From small to big, and everything in between. Share your garden and help make this site a great place for gardeners to dream, learn and share! If you would like to have your garden featured in one of our Weekly Garden Showcases, email us your garden story and pictures at info@thisismygarden.com, or use the share my garden tab on the website and submit it online. Be sure to follow us on Facebook and Instagram to get our updates as well! My 3 Big Secrets To Growing Tomatoes – Grow Great Tomatoes This Year!